For this weekend only (Saturday the 21st of May and Sunday the 22nd of May), and to celebrate the impending release of "Scenes of Mild Peril", the Kindle versions of both my first two collection of short stories - "The Shadow Cast by the World" and "Forever and Ever, Armageddon" are available for free on Amazon. Clicking on this handy link here will take you to my Amazon author page. Read them, and if you enjoy either of them, I'd much appreciate you sticking a nice review on either Amazon or Goodreads. You don't have to have a kindle to read them - the free Kindle App is available for all smartphones, and is also available for both PC and Mac Platforms (The VIC-20, Oric Atmos, V-Tech My First Laptop and the Texas Instruments TI-99/4A are currently not Kindle compatible). Come on in, take a pew, and have a glass of whatever you fancy. Mine host welcomes you to your own personal lock-in at the Tavern of Weird Ales. In this delightful tome of beer and pub-flavoured stories, you will find a wicked brew of eleven glorious tales guaranteed to make you shudder. From a low-calorie lager that might be one beer too many, to a tentacled tavern of terrifying tipples, it's all here, in round-after-round of weird and wonderful fiction. The spirits are with us and your time has been called. 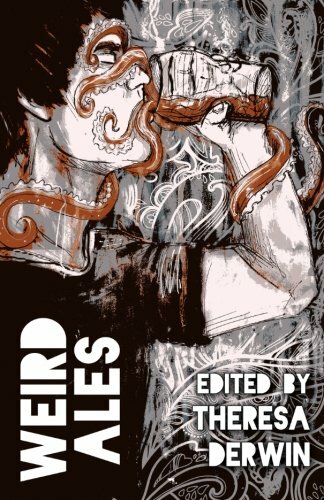 The first volume of "Weird Ales" from Quantum Corsets, an anthology of alcohol related horror, is now available. My story "In Vino Veritas, In Vino Mors" (the tale of a most unusual Oenophile and his mysterious acquaintance) concludes this fine collection of eleven tales. Topped off with a beautiful cover by the brilliant Luke Spooner, it's a great read, especially accompanied by a good pint and a bag or so of your favourite pub snacks. Click here to be taken to the Amazon page for the book, available in both paperback and kindle formats. I'd love to know what you think of it.